White water rafting can be a great deal of fun, exciting and thrilling! Following a few safety guidelines will help to ensure that you, your friends and family will always find rafting an enjoyable experience, ready to go back for more. It is so easy to make a mistake. Or get into a situation you are not prepared for or trained to handle. The rivers conditions change with the seasons, even from week to week. Being aware of all of the safety guidelines, river conditions and keeping your safety gear up to date can be a daunting task. Rely on the experts to provide you with a safe enjoyable experience. The single most important reason to use experts who are trained in whitewater rafting is the safety they provide with equipment, with knowledge of the river and of course the training they received prior to ever going on the river. This includes not only navigating white water rapids, it also includes first aid training and providing support in case their actually is an accident. Pay attention to what they say and follow their instructions. It could save your life. 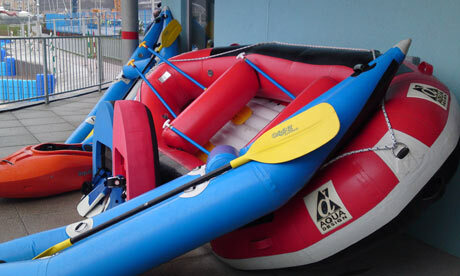 The equipment is expensive and this is often quoted as a reason to use a rafting company. While it is expensive, they also use the best equipment available, at least the good ones do. From the rafts themselves to the life jackets they provide it all means that you have a better chance of making it alive through the rapids in one piece than you would going rafting yourself. Of course it depends what skill level you consider the rapids to be. A class 1 or 2 river is something you can go canoeing quite safely, hover most experts will not even consider a class 5 set of rapids. If you really want to go rafting with your buddies on the weekend, go with one of the companies in your area that have a good reputation for safety as well as providing value for the money you will spend. White water rafting safety gear is so important. All companies should provide you with a minimum of a life jacket that fits you snugly and will not ride up, while keeping you afloat if you end up outside the raft. It should also at all times keep your head upright and for the most part out of the water, in case your head should strike a rock and knock you out. You want to be able to breathe and your head must be above the water line! Having excellent equipment is of course another important element. Rafts that are worn or dirty are not attractive and probably not safe. If you are planning to rafting early in the spring or even sometimes early summer you may want to wear a wet suit to avoid getting hypothermia. Mountain streams from melting snow can be very cold even in the summer months so you want to make sure you are dressed properly to avoid any problems in this way. Finally a means to contact emergency resources if there is an accident. They may not have cell phones with them, however they should have a method worked out that allows them to track rafting excursions and avoid any problems that might arise should no one know that they need help. This topic is so important. Many people go rafting every year, have a great time and would go back again. As long as you are on a set of rapids that are suitable for your strength and skill level, you will be fine. The higher class of rapids have a higher probability of tossing you into the river. With these types of rapids, before you even go for a trip you may need to prove that you can swim out of a whirlpool or whitewater and get to safety on your own. You will need the strength and the swimming ability to get out of the situation you find yourself in. These are for the expert level white water rapids which most of us will never see. Most people will go on gentler rapids with a few standing waves, get wet, enjoy the great out doors , the scenery and the fresh air. If you feel it necessary to try something more challenging, make sure that you are ready for them, which is the subject of the next section. If you are going to go on increasingly more challenging rapids, you should really be in top physical shape and be able to swim out of what ever situation you find yourself in. Stay in shape and practice with the companies that provide white rafting services. Most will also entertain applications to train as a raft guide, however you will need to demonstrate that your physical fitness is sufficient to deal with the rigors of rafting. We would enjoy anyone who wants to leave their comments about this subject or other comments related to white water rafting. Spam comments and blatant advertising is not accepted. it is so important to have the right safety gear when you go white water rafting. Do not ever just go and take the word of the instructor. He should be an expert but you should also know what you are getting into when you go white water rafting.